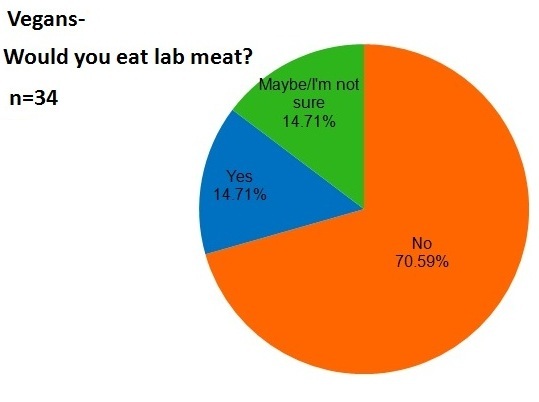 Last month we created a lab meat survey to take the temperature of both veg*ns and nonvegetarians about attitudes towards in vitro meat and to what extent animal harm played a role in resistance to eating it. I reviewed some of the results in the show but for a more detailed analysis, including graphs, keep reading after the jump. You can see all the questions and responses here on Surveymonkey (link gone 2018-06-25). To summarize, we asked people about their food choices (whether they were meat eaters, vegetarians, vegans etc.) and then we asked if they would eat lab meat, why or why not, and if they would eat lab meat if it caused no more animal death than eating plant food and why or why not. Disclaimer here: we only had a convenience sample (people we could recruit via Facebook and Twitter and through our friends and fans) of 63 participants in our survey so it’s not representative. Here is the breakdown. If you want to know how we defined the groups check out the survey (link gone). Would vegans eat lab meat? Here are some examples of things people said about why they gave their answer. If it doesn’t harm animals it’s vegan to me. I never had a problem with meat apart from the harm it causes. It is an intelligent, compassionate choice! Someday we will look back and wonder why we were so cruel and wasteful using animals! The ends don’t justify the means – animals are being used as raw materials for this big experiment, since their cells are being taken….That means confining and experimenting on animals in order to come up with something that’s supposedly ‘ethical’. I find eating meat disgusting now and even if there were no cruelty involved (and that’s a big if!) there are still the health consequences to consider. Animal use is required to develop “lab-grown meat”….consuming animal products, even from nonsentient sources, reinforces the paradigm of animals as our resources. Most surprising of all (to me anyway) is that vegans did not change their minds about eating lab meat if there was no more animal death involved than plant food. Only one participant changed from “no” to “I don’t know” in that condition and there were no moves to “yes”, in fact one participant moved from “yes” to “I don’t know”! 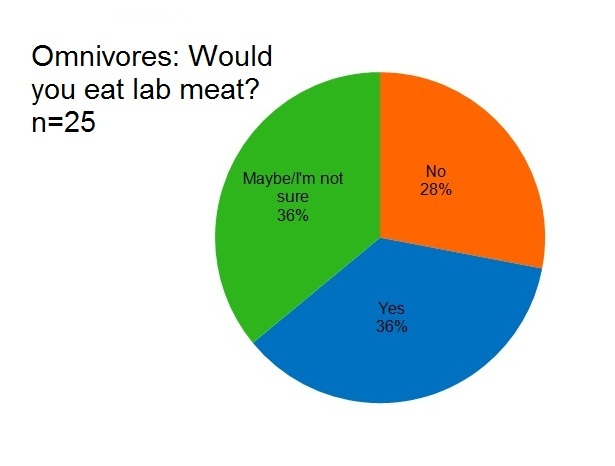 In the second question many vegans expressed doubt about the possibility of making lab meat without animal deaths, others expressed health concerns, others stated that the environmental impact would still be too great to warrant it. …accidental death of insects etc while cultivating crops does not equate to deliberate deaths from growing something unnatural and unnecessary. …I would still say no, but …I’m overall most in support of whatever reduces the culture of factory farming conscious animals. I think lab-grown meat could have incredible implications for animal treatment world-wide. Would nonvegetarians eat lab meat? it sounds a lot less disgusting than the ingredients of a mcdonald’s double cheeseburger, which i eat about once a week. of course, the lack of death and suffering involved in real meat, is also very appealing. If it looks like meat, smells like meat, and tastes like meat, it’s meat, and I’ll eat it! I do not eat animals that live on land because it feels like cannibalism. What happens when we stipulate that the lab meat has no more animal death than plant foods? Interestingly we see the same pattern in meat eaters that we did in the vegans except likely for a different reason. Only one person moves to “yes”. I don’t give a sh*t about the animal death rate. You may have noticed that we chucked out the vegetarians. Well, we didn’t really have much of a sample considering there were only four of them but, for the curious, two said no, one said yes, one said maybe, and nobody changed their minds in the “low animal death” condition. So, considering that this is a small sample I still have some confidence that the majority of vegans would not eat lab grown meat although a minority might endorse others eating it. 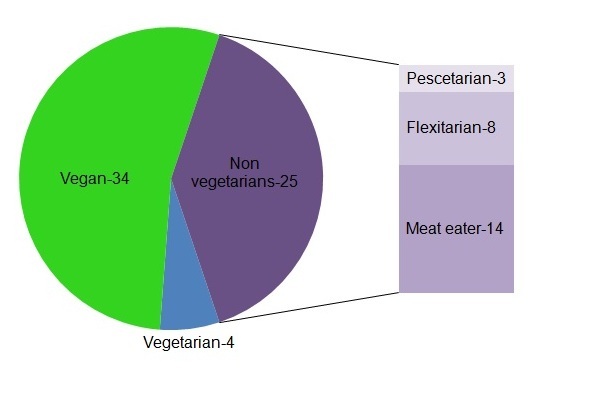 Among meat eaters we do not have a representative sample but another survey has been done in the UK that found 62% of nonvegetarians said they would not eat lab meat. What do these results mean for lab meat and its development? In my next blog I’ll speculate about whether or not our attitudes towards this technology will reduce its potential impact and how it might help animals. Would you eat replicator meat? Ultimately it was one of the many straws that broke this (ex)vegan’s back. Very cool survey and I think your options are funny! It’s so interesting that vegans don’t seem to have changed much in the last 6 years. I might (if I have some time) load people’s responses into a word analysis program and see how much disgust based words come up.